It’s ‘mos-def one of the most popular sandwiches on our meaty planet. We’re talkin’ ‘bout the beloved BLT. You know the deal. Unless you’ve been living under a rock all your life, you know what BLT stands for. But the question becomes – Is it the bread, the bacon, or the LT that makes a BLT so great? As extraordinaire BLT sandwich specialists, here at Doghouse Pizza, we thought we’d help you out by sharing the secret of the perfect BLT (*not so subtle hint* it’s bacon). Did we also mention that we’re bacon connoisseurs? Yep, we got it like that. 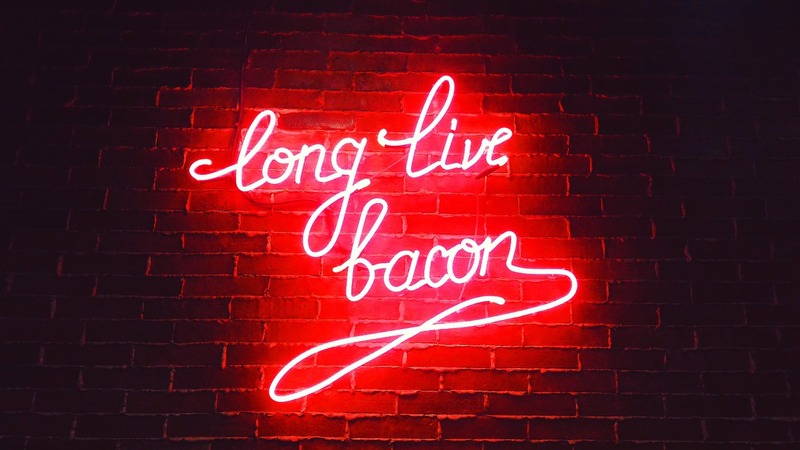 First – some intel on the history of bacon. Would you believe that bacon goes back thousands of years to 1500 BC? Yep, it’s true. And there are several varieties of bacon. But whatever you do, don’t ask for “turkey” bacon up in here. Someone may run you out of the joint. The bacon as we know it is cured pork. Plain and simple. Aren’t you craving one of these strips of yumminess right now? Vegans and Vegetarians aside, everybody loves bacon – right? What is there not to like? It’s very tasty with a lot of flavor and makes everything tastes a little bit better. It has lots of protein. And it’s very versatile. Let’s see— it’s a great one-man-act—handling its business all on its own. It’s also an integral part of the traditional breakfast – can you say, bacon and eggs? Everyone else does. You can also add it to your salad, pot of collar or other greens, a baked potato, burgers, and other sandwiches. Some people like adding it to their potato salad or brussels sprouts dish. And of course, you can add it to pizza. That’s the way we roll up in here! Yummy! Of course, the most popular bacon dish on the Doghouse Pizza menu is our B.L.T., which features bacon, bacon, bacon, and more bacon, along with a side of LT, aka – lettuce and tomato. Hey- you know you gotta’ get your veggies in – right? Now – back to the secrets of how to make the best BLT sandwich, ever! The most important element is crisp, mouthwatering bacon. The sky’s the limit. That’s how we do it at Doghouse Pizza. Sure, we also add mayo, lettuce, and tomatoes, but our sandwich is all about the bacon. We’ll love for you to come in and try one out. At Doghouse. Our Menu is Lit! And if – for some unexplained reason you’re not in the mood for a bacon sandwich, no worries. We got chu! We have a slew of other delicious sandwiches, salads, pizza, and appetizers on our menu that will satisfy any food craving. Doghouse Pizza serves up some hella good dishes up in here! And to think – you don’t have to leave home to enjoy them. We offer delivery service through our bite squad. Again – we got chu! Enjoy your food – and don’t forget to take a little time to smell the bacon!